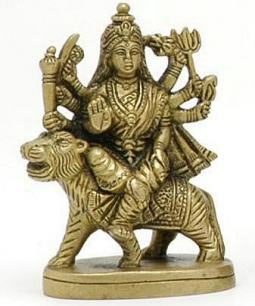 This is a Goddess Durga Statue as she rides to victory upon her Lion, which is the cosmic vehicle that the goddess Durga uses to travel the Universe and slay her enemies. 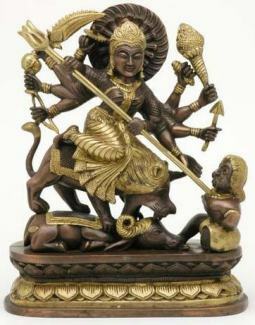 Durga is seen here trampling over the skulls of slain demons. 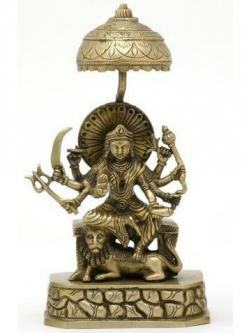 This statue stands 7 inches tall from the top of Durga's head, down to the base of the statue. These Goddess Durga statues are made to look like they have been weathered, so they have a special rust red coloring applied to them. 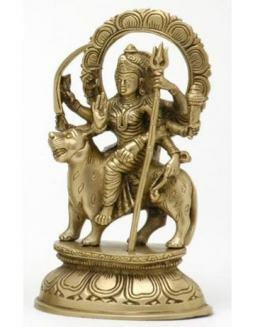 Then they are polished so that the red coloring is primarily only in the folds of Durga's clothing, headdress, and her lion's mane.